The immune system is an organization of cells and molecules with specialized roles in defending against pathogenic bacteria (extra and intracellular), viruses (intracellular), fungi, protozoa other parasites and also to protect us from neoplastic cells. The responses to invading microbes are categorized as innate and adaptive, according to their antigen recognition receptors and ability to establish immunological memory. When a wild pathogen enters the body for the first time, it immediately encounters cells of the innate immune system that are constantly patrolling for invaders. These sentries include macrophages, neutrophils and dendritic cells, which engulf and destroy pathogens as well as infected body cells. The guard cells then break down the material they have ingested and display samples of the intruder's components-known as antigens so that members of the adaptive immune system, T and B cells, can become familiar with the pathogen's appearance. At the same time, the antigen-presenting cells release signaling chemicals called cytokines that induce inflammation and alert T and B cells to the emergency. The crosstalk between these systems has lead to the emergence of an interdisciplinary field called osteoimmunology. Although osteoimmunology started with the study of the immune regulation of osteoclasts, its scope has been extended to encompass a wide range of molecular and cellular interactions, including those between osteoblasts and osteoclasts, lymphocytes and osteoclasts, and osteoblasts and hematopoietic cells. The immune system is spawned in the bone marrow reservoir and it is now recognized that important niches also exist there for memory lymphocytes. At the same time, various factors produced during immune responses are capable of profoundly effecting regulation of bone. Therefore, the two systems should be understood to be integrated and operating in the context of the osteoimmune system, a heuristic concept that provides not only a framework for obtaining new insights by basic research, but also a scientific basis for the discovery of novel treatments for diseases related to both systems. Osteoclasts are cells of hematopoietic origin that decalcify and degrade the bone matrix by acid decalcification and proteolytic degradation, respectively, and thus causing bone resorption. They are large, multinucleated cells formed by the fusion of precursor cells of the monocyte -macrophage lineage  [Figure 1]. Osteoclastogenic signals are mediated by RANKL and its co-stimulatory signals, in addition to M-CSF. M-CSF and the transcription factor PU.1 are crucial for the proliferation and survival of osteoclast precursor cells. 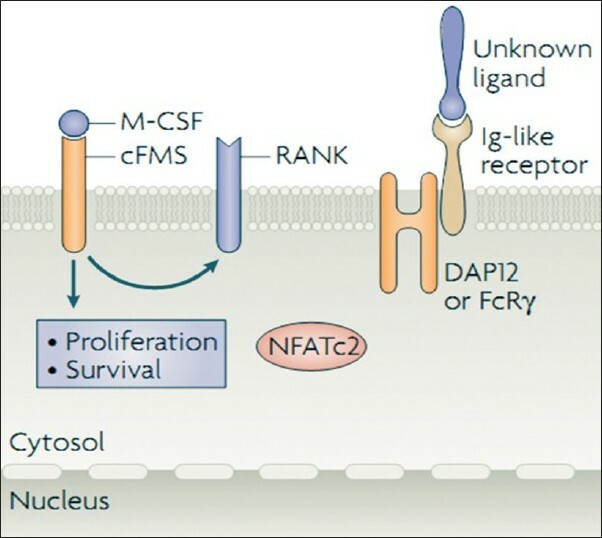 M-CSF transmits its signal to the cell through the specific receptor c-fms, which is a member of the receptor tyrosine kinase superfamily [Figure 2]. M-CSF is also crucial for the proliferation and survival of precursor cells of macrophages, mainly by activating ERK through GRB2 and AKT through P I3K. M-CSF also stimulates the expression of RANK in monocyte-macrophage precursor cells, thereby rendering them able to efficiently respond to RANKL. PU.1, a member of the ETS family of transcription factors, regulates the development of macrophages and osteoclasts by controlling the expression of c-fms. T cells represent the major regulatory players in bone destruction. Conventional T cells comprise two subtypes: Cytotoxic T cells and helper T (T H ) cells which are distinguished by their restriction molecules for antigen presentation. When T H cells recognize antigen in association with supportive signals (costimulatory signals), they undergo a transition from naοve to effector T H cells. Effector T H cells can be divided into several functional phenotypes dependent on their cytokine profile, such as T H 1, T H 2, T H 17, T reg cells. Effector T H cells regulate adaptive humoral immunity by interacting with B cells and influence the maturation and activation of innate immune cells, such as macrophages, dendritic cells, and granulocytes. Recently, studies have demonstrated that T H cells also have effects on osteoclast commitment. T H cell subset involved in the production of IL-17 (T H 1 cells) is considered to be the typical osteoclastogenic. IL-17 induces the synthesis of MMPs inducing the bone and connective tissue degradation. These effects are balanced by T reg cells which inhibit bone destruction through suppression of osteoclast formation by a cell contact dependent manner that might be mediated by the expression of CTLA-4, which binds to B7-1 and B7-2 in the preosteoclasts. , Thus directly inhibiting osteoclast differentiation. T regulatory cells also express cytokines, like IL-4, IL-10, and TGF-β which not only have anti-inflammatory properties, but also suppress osteoclastogenesis. These include a) Transcription factors b) Immune receptors and costimulation. (A) Transcription factors include NF-kB, AP-1, NFAT, STAT 1, Schnurri -3 (SHN 3), a DNA binding protein. Therefore, accumulating evidence indicates that a great number of transcriptional regulators are shared by the immune and the bone systems, and they control not only osteoclasts but also osteoblasts. (a) RANK, the signaling receptor for RANKL, mediates osteoclastogenesis. RANK signal transduction is mediated by adapter proteins called TRAFs. The key signals sent through RANK in osteoclast precursors are mediated by the adapter molecule TRAF 6. Downstream of TRAF 6, TRANCE signaling in osteoclasts activates P I3K, c-Src, JNK1, ERK, p38 MAPK, and subsequently a series of transcription factors including NF-kB, c-Fos, Fra-1, and NFATc1. (b) c-fms is a receptor for M-CSF. It is also known as colony stimulating factor receptor. M CSF transmits its signal to the cell through the specific receptor c-fms which is a member of the receptor tyrosine kinase superfamily. M-CSF is crucial for the proliferation and survival of precursor cells of osteoclasts as well as macrophages. Two key factors produced by osteoblasts play a crucial role in regulating bone resorption by osteoclasts. (a) RANKL/TRANCE/OPGL/ODF (b) OPG. RANKL is of two types, a membrane associated cytokine and soluble cytokine. In immune system, RANKL seems to be multifunctional and its role is dependent on the RANKL-expressing cell type. 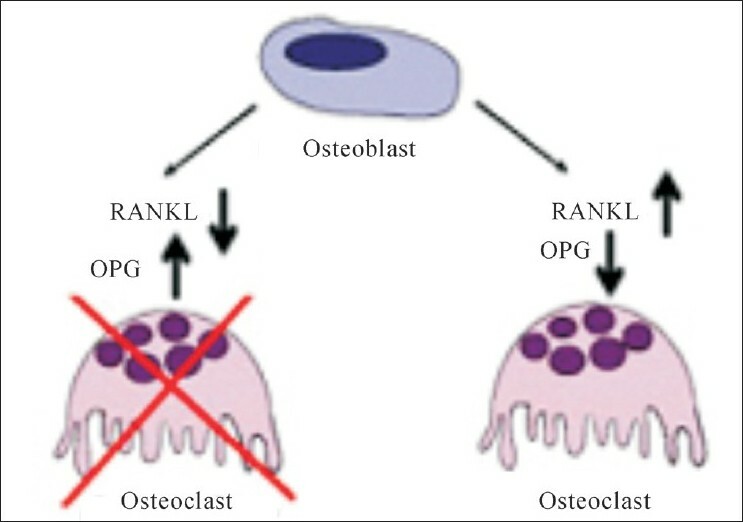 RANKL is not only been reported to be involved in physiological osteoclastogenesis, but also in pathological bone loss. Therefore, the balance between RANKL and OPG determines bone resorption. 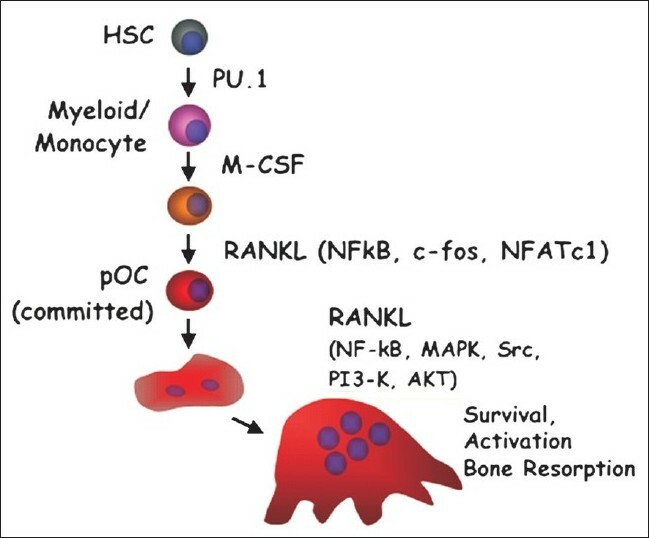 The key factor for osteoclast proliferation and differentiation is signaling through RANK -RANKL. RANK, present on the preosteoclast and osteoclast surfaces by itself does not have intrinsic enzymatic activity and needs to recruit adaptor proteins such as TRAF, especially TRAF 6. Binding of this protein to RANK induces trimerization of TRAF 6 leading to the activation of NF-KB and MAPK inducing JNk and p38. Therefore, TRAF 6 acts downstream of RANK inducing in preosteoclasts, the expression of target gene activator AP-1 and NFATc1 leading to preosteoclasts fusion and to osteoclast differentiation and in osteoclastic bone resorption by inducing membrane ruffling action and actin ring formation through the activation of c-Src signaling cascade. In addition to the signaling pathways mentioned above, TRANCE stimulation also triggers reactive oxygen species (ROS) production. ROS, such as superoxide anions, hydroxyl radicals, and H 2 O 2 , have been associated with many cellular responses including metabolic bone diseases. 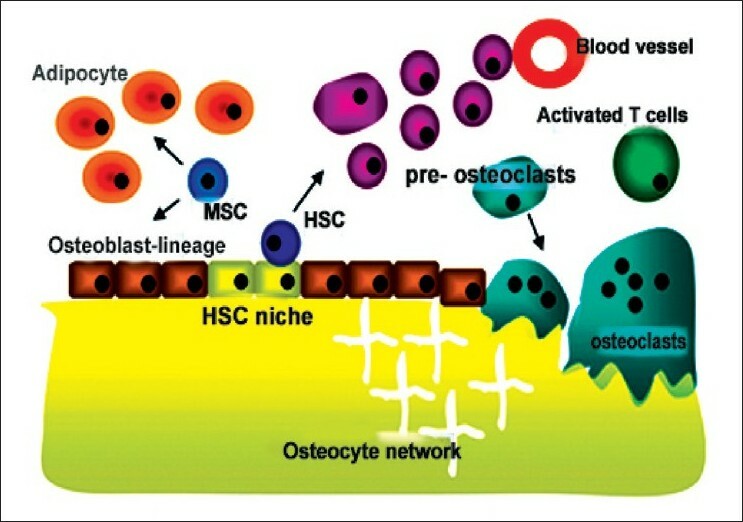 Osteoclast proliferation also depends on the presence of M-CSF produced by other cells and by osteoblasts, that upon binding to its receptor, c-fms, at the surface of pre-osteoblast cells, activates and intracellular cascade that ultimately leads to proliferation and survival of osteoclasts. In this way, the osteoblasts produce the key factors RANKL and M-CSF that promote osteoclasts proliferation and differentiation. RANKL also interacts with ITAM by inducing its phospho-rylation, thus increasing the expression of immunoglobulin-like receptors and enhancing ITAM signal. ITAM mediated signals cooperate with RANK to stimulate calcium signaling through ITAM phosphorylation and resulting in activation of SYK and PLCg. Further modulation of osteoclastogenesis is provided by Toll-like receptors.TLR expression was detected on bone cells and direct signaling through TLR activates a signaling cascade mediated by TRAF 6 leading to the activation of transcription factors such as NF-kB and AP-1 and also synthesizes and release proinflammatory cytokines. Finally, bone also interacts with B cell biology as RANKL is known to influence B lymphocyte development, increasing pro-B cell proliferation. As discussed, the immune system has several cross talk points with skeletal system among which T and B lymphocyte interactions with bone cells, cytokine and chemokine dependent bone resorption, TLR signaling and costimulating molecules. Together these factors modulate bone remodeling. Periodontitis is caused by a host response to the presence of gram negative bacteria (Actinobacillus actinomycetem-comitans, Porphyromonas gingivalis) or their products that invade connective tissue and alveolar bone. 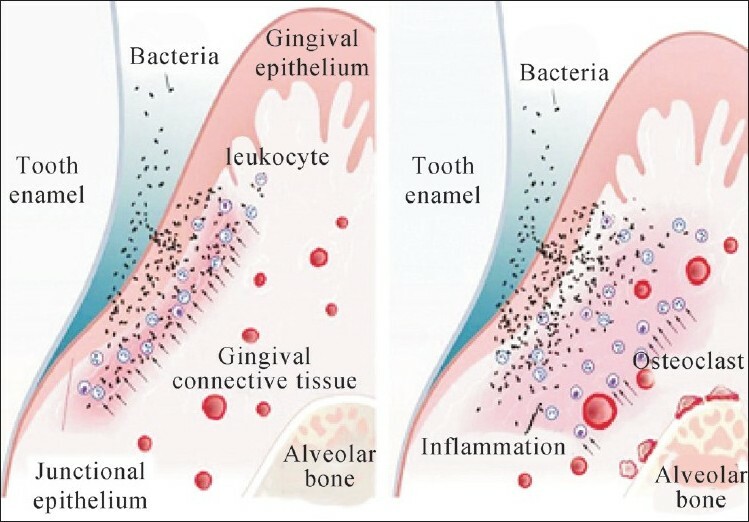 Since the presence of bacteria is required, but not sufficient to trigger periodontitis, the recognition of microbial components as 'danger signals' by host cells and subsequent production of inflammatory mediators is an essential step in pathogenesis of periodontitis. The RANKL-RANK-OPG axis clearly is involved in the regulation of bone metabolism in periodontitis in which an increase in relative expression of RANKL or a decrease in OPG can tip the balance in favor of osteoclastogenesis and the resorption of alveolar bone that is the hallmark of periodontal disease.Interference with the RANKL-RANK-OPG axis may have a protective effect on bone loss. Current treatment for periodontitis often relies on mechanical procedures and neglects the immune cells. Newer treatments for periodontal diseases must address the major immune cell contribution to periodontal bone resorption. Therefore, an important emphasis of new therapies should involve the development and evaluation of therapeutic strategies to treat immune cell-mediated periodontal disease. 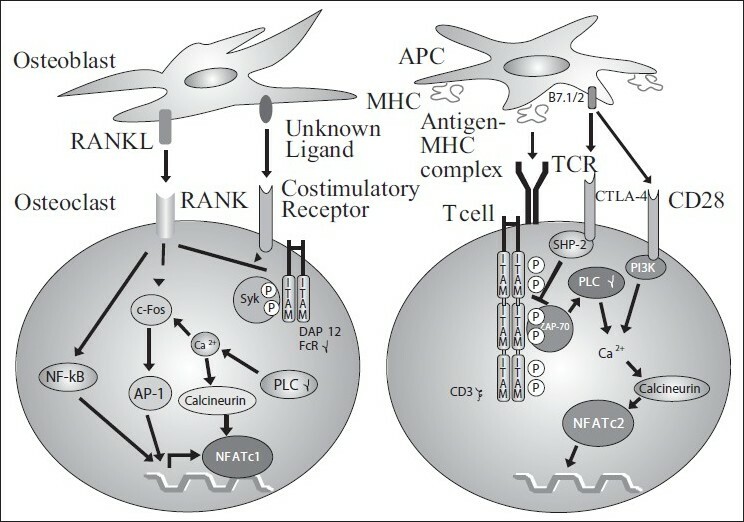 In recent years, biological agents and molecular inhibitors were developed for the treatment of inflammatory diseases accompanied by bone destruction which target molecules expressed in T cells and osteoclasts such as a specific antibody to RANKL, a fusion protein, comprising CTLA-4 and human immunoglobulin, certain drugs which are under development are inhibitors of IL 17, NFkB inhibitors and SYK inhibitors, in vitro suppression of NFATc1, Bisphosphonates, Cyclosporin A,TNF α antagonists, and drugs inhibiting Cathepsin K.
Apart from immune cells, adipocytes also play role on immune as well as skeletal systems [Figure 9]. Adipocytes present in adipose tissue releases adipokines such as leptin, adiponectin, visfatin, and resistin. Adipocytes also secrete IL-1 and TNF-α which are positive stimulus for the expression of leptin. Leptin, a major adipokine, is also released by immune cells and osteoblasts. It regulates the body weight through appetite suppression and increased energy expending. Induces peripheral blood mononuclear cells to secrete pro-inflammatory cytokines, such as IL-6, TNF-α and IFN-α and itself acts as a pro-inflammatory cytokine by activating monocytes, modulating phagocytosis of macrophages and stimulates neutrophil production of reactive oxygen species several cells involved in the immune response. Leptin plays a major role in bone homeostasis, reproduction, development, hematopoiesis, and angiogenesis interferes in the T-cell balance inducing T-cell activation toward a Th 1 type response. Acts on bone receptors that promote the development of osteoprogenitor cells and stimulate osteoblasts to form new bone. Acts through CNS decreasing osteoblast activity. Leptin increases bone formation by enhancing human osteoblast proliferation, collagen synthesis and mineralization and positively favoring OPG/RANKL ratio through down regulation of RANKL. Leptin exerts antiapoptotic role by reducing the mRNA levels of Bax/Bcl-2, which facilitate the transition of mature osteoblasts to osteocytes. Thus, understanding the basis of osteoimmunology and application of these principles targeting the molecular mechanisms though at a preliminary phase, aspires immune modulation. The pathogenesis of periodontal diseases involves both the inflammatory as well as immune mechanisms. The amplification and propagation of the inflammatory response through gingival tissue is critical to the pathogenesis of periodontitis. However, it is the spread of the response to areas adjacent to alveolar bone that drives the cellular machinery involved in bone loss. 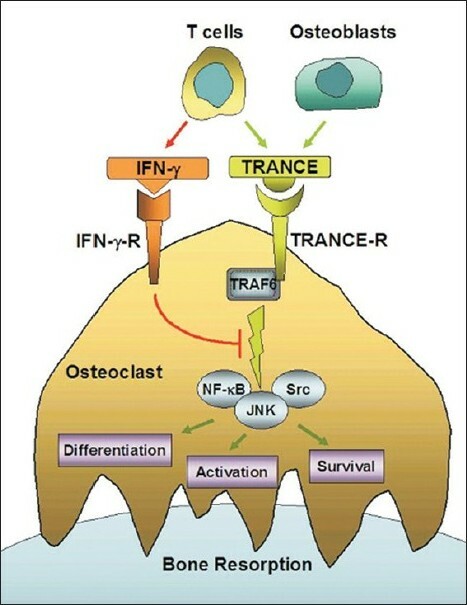 Characterization of the functions of TRANCE-RANK-OPG axis has contributed significantly to the emergence of osteoimmunology, specifically with respect to examination of the interplay between active immunity and maintenance of bone homeostasis. Though modulating the immune system is a delicate work, targeting the alterations of this axis may form the basis for rational drug therapy in treating the periodontal pathosis effectively. This review has highlighted on the critical aspects in the field of osteoimmunology, the osteblast-osteoclast cross talk and the new and innovative therapeutic interventions in treating periodontal disease. ­AP-1-Activator Protein, ATF-Activating Transcription Factor, B7-1 and B7-2-Homologous costimulatory ligands found on antigen presenting cells, Bax/Bcl-2-Bcl-2-associated X protein/B cell lymphoma 2, c-fms (cellular-full mitochondrial sequence )/ MCSFR-Macrophage colony stimulating factor receptor, c-Fos is a cellular proto-oncogene belonging to the immediate early gene family of transcription factors, c-Src-proto-oncogenic tyrosine kinase, src-'sarcoma', cCbl -Casitas B-lineage lymphoma, CTLA-4- Cytotoxic T lymphocyte Asssociated, DAP 12 -DNAX-activation protein 12, DNA X-gene that codes for the T and g subunits of the DNA clamp loader of prokaryotes, DC-STAMP- Dendritic cell-specific trancemembrane protein, ERK-Extracellular-signal-regulated kinase, FRA-1 and 2-Fos related antigen 1 and 2, Fos- FBJ murine osteosarcoma viral oncogene. The human oncogene c-fos is homologous to the Finkel-Biskis-Jinkins (FBJ) murine osteosarcoma virus oncogene. GM-CSF-Granulocyte -macrophage colony stimulating factor, GRB2-Growth Factor Receptor Bound Protein 2, HSC-Hematopoietic stem cells, ITAM-Immunoreceptor tyrosine-based activation motif, JNk-Jun N-terminal kinases, MITF-Microphthalmia-associated transcription factor, MAPK-Mitogen activated kinases, M-CSF-Macrophage-Colony Stimulating Factor, NF-kB-Nuclear factor kappa-light-chain-enhancer of activated B cells, NFATc1-Nuclear factor of activated T cells and cytoplasmic calcineurin dependent 1, NODP-Nucleotide-binding oligomerization, OSCAR-Osteoclast associated receptor, OPG-Osteoprotegerin, OPGL-Osteoprotegerin ligand, ODF-Osteoclast differentiation factor, PU.1- Purine rich, protein in humans coded for SPI 1 gene, PAMP-Pathogen associated molecular patterns, P I3K-Phosphoinositide-3-kinase, (PIR) -A- Paired immunoglobulin receptor, PPAR-γ -Peroxisome proliferative activated receptor g, PLCg-Phospholipase Cg, RANKL-Receptor activator of nuclear factor kappa -light-chain-enhancer of activated B cell ligand, RANK-Receptor activator of nuclear factor kappa-light -chain-enhancer of activated B cell, SIRP- signal-regulatory protein, SOCS-Suppressors of cytokine signaling proteins, SYK- spleen tyrosine kinase, TRANCE- (R)-TNF related activation induced cytokine-receptor, TRAF-TNF receptor associated factor, TREM-2- Trigger receptors expressed on myeloid cells. 1. Garcon N, Goldman M. Boosting vaccine power. Scientific American India 2009. United States: Nature Publishing Group; 2009. p. 52-9. 2. Delves PJ, Roitt IM. The immune system. First of two parts. N Engl J Med 2000;343:37-49. 3. Takayanagi H. Osteoimmunology: Shared mechanisms and crosstalk between the immune and bone systems. Nat Rev Immunol 2007;7:292-304. 4. Arron JR, Choi Y. Bone versus immune system. Nature 2000;408:535-6. 5. Leibbrandt A, Penninger JM. Advances in Experimental Medicine and Biology, 12 th ed., Vol. 658. 2010. 6. Caetano-Lopes J, Canhão H, Fonseca JE. Osteoimmunology - The hidden immune regulation of bone. Autoimmun Rev 2009;8:250-5. 7. Seeman E, Delmas PD. Bone quality - the material and structural basis of bone strength and fragility. N Engl J Med 2006;354:2250-61. 8. Harada S, Rodan GA. Control of osteoblast function and regulation of bone mass. Nature 2003;423:349-55. 9. Nakashima K, Zhou X, Kunkel G, Zhang Z, Deng JM, et al. The novel zinc finger-containing transcription factor osterix is required for osteoblast differentiation and bone formation. Cell 2002;108:17-29. 11. Cochran DL. Inflammation and Bone Loss in Periodontal Disease. J Periodontol 2008;79:1569-76. 12. Herman S, Kronke G, Schett G. Molecular mechanisms of inflammatory bone damage: Emerging targets for therapy. Trends Mol Med 2008;14:245-53. 13. Gillespie MT. Impact of cytokines and T lymphocytes upon osteoclast differentiation and function. Arthritis Res Ther 2007;9:103. 14. Graves D. Cytokines that promote periodontal tissue destruction. J Periodontol 2008;79:1585-91. 15. Boyle WJ, Simonet WS, Lacey DL. Osteoclast differentiation and activation. Nature 2003;423:337-42. 16. Lee SH, Kim TS, Choi Y, Lorenzo J. Osteoimmunology: Cytokines and the skeletal system. BMB Rep 2008;41:495-510. 17. Teitelbaum SL, Ross FP. Genetic regulation of osteoclast development and function. Nature Rev Genet 2003;4:638-49. 18. Zinkernagel RM, Hengartner H. Regulation of the immune response by antigen. Science 2001;293:251-3. 19. Bettelli E, Oukka M, Kuchroo VK. T(H)-17 cells in the circle of immunity and autoimmunity. Nat Immunol 2007;8:345-50. 20. Sato K, Suematsu A, Okamoto K, Yamaguchi A, Morishita Y, Kadono Y, et al. Th17 functions as an osteoclastogenic helper T cell subset that links T cell activation and bone destruction. J Exp Med 2006;203:2673-82. 21. Furuzawa-Carballeda J, Vargas-Rojas MI, Cabral AR. Autoimmune inflammation from the Th17 perspective. Autoimmun Rev 2007;6:169-75. 22. Zaiss MM, Axmann R, Zwerina J, Polzer K, Gückel E, Skapenko A, et al. Treg cells suppress osteoclast formation: a new link between the immune system and bone. Arthritis Rheum 2007;56:4104-12. 23. Ruocco MG, Maeda S, Park JM, Lawrence T, Hsu LC, Cao Y, et al. IkB kinase (IKK) b, but not IKKa, is a critical mediator of osteoclast survival and is required for inflammation-induced bone loss. J Exp Med 2005;201:1677-87. 24. Wagner EF, Eferl R. Fos/AP-1 proteins in bone and the immune system. Immunol Rev 2005;208:126-40. 25. Crabtree GR, Olson EN. NFAT signaling: Choreographing the social lives of cells. Cell 2002;109: S67-79. 26. Hogan PG, Chen L, Nardone J, Rao A. Transcriptional regulation by calcium, calcineurin, and NFAT. Genes Dev 2003;17:2205-32. 27. Takayanagi H, Kim S, Koga T, Nishina H, Isshiki M, Yoshida H, et al. Induction and activation of the transcription factor NFATc1 (NFAT2) integrate RANKL signaling for terminal differentiation of osteoclasts. Dev Cell 2002;3:889-901. 28. Koga T, Matsui Y, Asagiri M, Kodama T, de Crombrugghe B, Nakashima K, et al. NFAT and Osterix cooperatively regulate bone formation. Nat Med 2005;11:880-5. 29. Kim NS, Kim HJ, Koo BK, Kwon MC, Kim YW, Cho Y, et al. Receptor activator of NF-kB ligand regulates the proliferation of mammary epithelial cells via Id2. Mol Cell Biol 2006;26:1002-13. 30. Takayanagi H, Kim S, Koga T, Taniguchi T. STAT 1-mediated cytoplasmic attenuation in osteoimmunology. J Cell Biochem 2005;94:232-40. 31. Kim S, Koga T, Isobe M, Kern BE, Yokochi T, Chin YE, et al. Stat1 functions as a cytoplasmic attenuator of Runx2 in the transcriptional program of osteoblast differentiation. Genes Dev 2003;17:1979-91. 32. Jones DC, Wein MN, Oukka M, Hofstaetter JG, Glimcher MJ, Glimcher LH. Regulation of adult bone mass by the zinc finger adapter protein Schnurri-3. Science 2006;312:1223-7. 33. Walsh MC, Kim N, Kadono Y, Rho J, Lee SY, Lorenzo J, et al. Osteoimmunology: Interplay between the immune system and bone metabolism. Annu Rev Immunol 2006;24:33-63. 34. Gober HJ, Takayanagi H. The interactions and shared mechanisms of T cells and osteoclasts. Inflamm Regene 2009;29:239-48. 35. Miyamoto T, Toyama Y. DC-STAMP and Osteo immunology: A mini review. Inflamm Regen 2009; 29:59-62. 36. Merck E, Gaillard C, Gorman DM, Montero-Julian F, Durand I, Zurawski SM, et al. OSCAR is an FcRg-associated receptor that is expressed by myeloid cells and is involved in antigen presentation and activation of human dendritic cells. Blood 2004;1045:1386-95. 37. Mao D, Epple H, Uthgenannt B, Novack DV, Faccio R. PLCg2 regulates osteoclastogenesis via its interaction with ITAM proteins and GAB2. J Clin Invest 2006;116:2869-79. 38. Wu CP, Jiang JT, Tan M, Zhu YB, Ji M, Xu KF, et al. Relationship between co-stimulatory molecule B7-H3 expression and gastric carcinoma histology and prognosis. World J Gastroenterol 2006;12:457-9. 39. Jones DH, Nakashima T, Sanchez OH, Kozieradzki I, Komarova SV, Sarosi I, et al. Regulation of cancer cell migration and bone metastasis by RANKL. Nature 2006;440:692-6. 40. Theill LE, Boyle WJ, Penninger JM. RANK-L and RANK: T cells, bone cells, and mammalian evolution. Annu Rev Immunol 2002;20:795-823. 41. Wong BR, Josien R, Lee SY, Sauter B, Li HL, Steinman RM, et al. TRANCE (tumour necrosis factor [TNF]- related activation induced cytokine), a new TNF family member predominantly expressed in T cells, is a dendritic cell-specific survival factor. J Exp Med 1997;186:2075-80. 42. Ashcroft AJ, Cruickshank SM, Croucher PI, Perry MJ, Rollinson S, Lippitt JM, et al. Colonic dendritic cels, intestinal inflammation, and T cell-mediated bone destruction are modulated by recombinant osteoprotegerin. Immunity 2003;19:849-61. 43. Kim D, Mebius RE, MacMicking JD, Jung S, Cupedo T, Castellanos Y, et al. Regulation of peripheral lymphnode genesis by the tumour necrosis factor family member TRANCE. J Exp Med 2000;192:1467-78. 44. Akiyama T, Shimo Y, Yanai H, Qin J, Ohshima D, Maruyama Y, et al. The tumour necrosis factor family receptors RANK and CD40 cooperatively establish the thymic medullary microenvironment and self-tolerance. Immunity 2008;29:423-37. 45. Bachmann MF, Wong BR, Josien R, Steinman RM, Oxenius A, Choi Y. TRANCE, a tumour necrosis factor family member critical for CD40 ligand- independent T helper cell activation. J Exp Med 1999;189:1025-31. 46. Asagiri M, Takayanagi H. The molecular understanding of osteoclast differentiation. Bone 2007;40:251-64. 47. Rho J, Takami M, Choi Y. Osteoimmunology: Interactions of the Immune and Skeletal systems. Mol Cells 2004;17:1-9. 48. Wu H, Arron JR. TRAF6, a molecular bridge spanning adaptive immunity, innate immunity and osteoimmunology. Bio Essays 2003;25:1096-105. 49. Wahli W. PPAR gamma: Ally and foe in bone metabolism. Cell Metab 2008;7:188-90. 50. Koga T, Inui M, Inoue K, Kim S, Suematsu A, Kobayashi E, et al. Costimulatory signals mediated by the ITAM motif cooperate with RANKL for bone homeostasis. Nature 2004;428:758-63. 51. Graves DT, Oates T, Garlet GP. Review of osteoimmunology and the host response in endodontic and periodontal lesions. J Oral Microbiol 2011;3:1-15. 52. Chapple IL. Oxidative stress, nutrition and neutrogenomics in periodontal health and disease. Int J Dent Hyg 2006;4 (Suppl. 1):15-21. 53. Uehara A, Takada H. Functional TLRs and NODs in human gingival fibroblasts. J Dent Res 2007;86:249-54. 54. Menezes R, Garlet TP, Letra A, Bramante CM, Campanelli AP, Figueira Rde C, et al. Differential patterns of receptor activator of nuclear factor kappa B ligand/osteoprotegerin expression in human periapical granulomas: Possible association with progressive or stable nature of the lesions. J Endod 2008;34:932-8. 55. Taubman MA, Kawai T, Han X. The new concept of periodontal disease pathogenesis requires new and novel therapeutic strategies. J Clin Periodontol 2007;34:370-6. 56. Gordeladze JO, Drevon CA, Syversen U, Reseland JE. Leptin stimulates human osteoblastic cell proliferation, de novo collagen synthesis, and mineralization: Impact on differentiation markers, apoptosis, and osteoclastic signaling. J Cell Biochem 2002;85:825-36. Vasluianu, R.I. and Ungureanu, D. and Jitaru, D. and Ioanid, A.D. and Forna, N.C.